This Pulitzer Prize-winning poet raised horses on a 200-acre farm near Warner, New Hampshire. Kumin was born of Jewish parents in the Germantown suburb of Philadelphia and her father was a pawnbroker. She received a B.A. degree (1946) and an M.A. (1948) from Radcliffe College. In 1946 she married a Harvard student, Victor Kumin, who became an engineering consultant. Kumin’s poetry focuses on family relations, the fragility of our environment, and the life and death of animals. Her publications of short stories, novels, and essays are in addition to her more than a dozen books of poetry, beginning with Halfway in 1961. Her subjects are more realistic than romantic and dare to grapple with threats to humans as well as animals both from scientific military power and from fundamentalist Christianity. 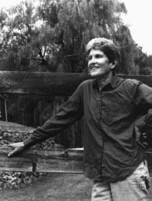 When Maxine Kumin joined Anne Sexton in 1957 in studying poetry with John Holmes in Boston, she and Anne became dear friends and wrote children’s books together before Anne Sexton committed suicide. Maxine Kumin, awarded a Pulitzer Prize for her book Up Country, held an appointment as Consultant in Poetry to the Library of Congress. Her poetry readings, workshops, and lectures in 48 states provided more income than all of her books of poems. Her most recent volumes include Looking for Luck (1992), Connecting the Dots (1996), Selected Poems (1997), The Long Marriage (2001) and Bringing Together (2003). Her neck was fractured and she was almost killed in 1998 in a horseback-riding accident. Despite the suffering, she continued to write until she died in 2014.
between a convent and a madhouse. The nunnery was white and brown. on a side porch, from rocking chairs. and ministered who loved him least. They shrieked because his needles stung. They sang for Christ upon His cross. into the garden where I played. the frightened sinner from his sin. my mother’s bed in Germantown. stood halfway up a hill, or down. black commas come scribbling across the shallows. and by mid-June, full-voiced, announce themselves. like hitchhikers, and strike out again for home. the life out of them in their small fists. frogs back to the fledglings in the rookery. nor is this, probably, purgatory. on the Baltimore and Ohio commuter line. Soon we will have dog fights and the Red Baron. The firebombing of Dresden is still to come. And the first two A-bombs, all that there are. are they not yet stored in their pouches?